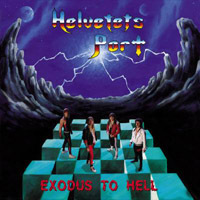 Helvetets Port is one of many new Swedish bands that have dedicated their sound to the eighties metal scene, just like Enforcer, In Solitude, Portrait, Dark Illusion etc. While the other bands mentioned here have been inspired by bands like Iron Maiden, Judas Priest and Mercyful Fate Helvetets Port's inspiration is a bit more obscure, something like NWOBHM meets Cirith Ungol. The song structures on "Exodus to Hell" are very simplistic (too simplistic for my taste), this makes the songs sound too similar. The singer Witchfinder (yeah right) is as best very very annoying and I think that even Motörhead albums have a better production. But Helvetets Port also have their good moments like the two tunes sung in Swedish; "Huvudlös Gestalt" and "Djävulens Triangel", it's like the Swedish lyrics adds another dimension to the songs. Well I hope that Helvetets Port will spend a lot of time in the rehearsal room before the next album.